This summer high school juniors and seniors from the IIT Boeing Scholars Academy program joined Zooniverse educators at the Adler Planetarium for six days of program prototyping. The IIT Boeing Scholars Academy seeks to inspire high-achieving Chicago-area teens to lead and serve through STEM with an emphasis on pursuing higher education. One component of the summer portion of the program is to embark on a Service Through STEM project during which the scholars coordinate with Chicagoland organizations on projects benefitting the organization. That’s where the Zooniverse team based at the Adler Planetarium comes in. It probably doesn’t come as a complete shock that the dedicated corps of Zooniverse volunteers is not largely comprised of teens. That’s something we’d like to change. What better way to figure out how to better get more teens involved in Zooniverse projects than by going straight to the source? Sixteen IIT Boeing Scholars worked with Zooniverse and Adler educators on strategies to engage more teens in Zooniverse citizen science projects at the Adler Planetarium. 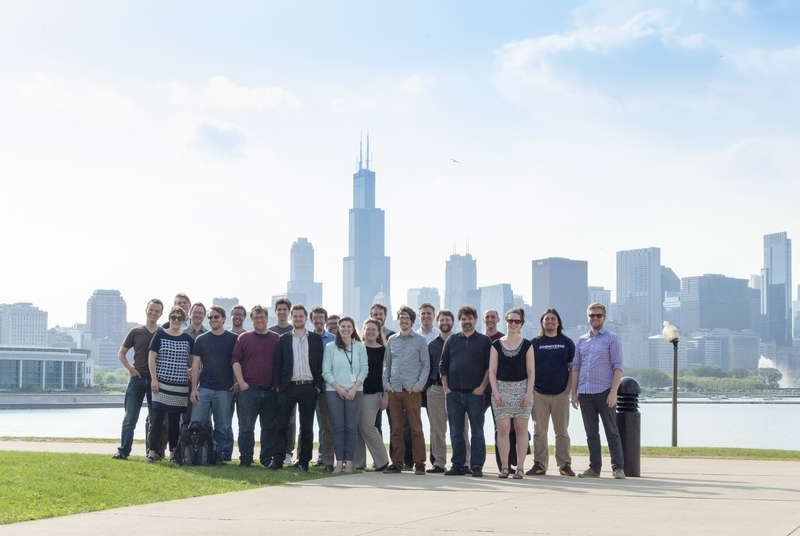 In order to develop ideas of how to better engage young people in Zooniverse citizen science projects, the sixteen IIT Boeing Scholars stepped into the role of informal science educator to develop a series of museum programs to potentially implement at the Adler Planetarium based around Zooniverse projects. What is the content of this program? What is the best format or program model to use? What should the audience take away? Answers to these questions formed the skeleton around which the programs would be built. This was the easiest question for the IIT Being scholars to answer. Since we’re looking for ways to engage teens in Zooniverse projects, the audience for the scholars’ programs was their high-school aged peers. The content for the programs being designed by the scholars was limited to the science content behind active Zooniverse projects. While a constraint, with over 20 active Zooniverse projects the list needed to be considerably narrowed down. The teens began assessing Zooniverse projects to determine which would be of the most interest to their peers. After careful review they selected Radio Galaxy Zoo, Condor Watch, Cyclone Center, and Planet Hunters as the projects that would be most engaging to teens. The science case behind each of these projects would be used as the meat and potatoes behind the programs the scholars designed. There are endless possible formats for an informal science program at a museum. In order to explore the options the IIT Boeing Scholars spent time exploring different museum programming models at the Adler. The participated in a 45-minute field trip workshop designed for 7th-12 graders, watched science demonstrations facilitated in Adler’s exhibits, explored museum exhibitions, and watched a planetarium skyshow. After this exploration the group created a menu of museum program models and defined them so that we could develop a shared vocabulary of what program models they would be working with. What is the goal of this program? Some informal science educators would call them learning goals; others might call them program objectives. Whatever they’re name, program developers should identify what they want their audience to take away from a program. These may be experiential goals like “Have fun” or more content driven goals like “ Program participants will be able identify lead poisoning as a threat to the endangered California condor population.” The IIT Boing Scholars aimed to incorporate at least one experiential goal and one content goal in their programs. Description: This 10 minute floor demonstration was designed to bring awareness to the problem of lead poisoning within the critically endangered California condor population and publicize how members of the public can assist scientists in their continuing efforts to save this species. The demonstration starts off with a video placing the viewer in the shoes of a condor suffering the effects of lead poisoning. Next the facilitator shows a hands-on activity showing how lead spreads throughout the condor’s body when it ingests a lead bullet embedded within the carcass on which it was feeding. The demonstrations ends by introducing Condor Watch as means to help research scientists better understand how to detect early warning signs of lead poisoning. Description: This group created a storyboard and script for a short skyshow. Unfortunately time did not allow for the development of a prototype that could be projected in one of the museum theatres. This program delved into the science behind tropical cyclones, also called hurricanes or typhoons. It introduced the mechanics of how these storms work, safety precautions that should be taken in the event of such a storm, and the drastic impacts these weather events can have on people and property. Cyclone Center was introduced as a way for people interested in meteorology to participate in the important research behind tropical cyclones. Program Name: Are We Alone? Description: This 5-10 minute floor demonstration was designed to take place on a small stage on the museum floor. Using the Drake Equation, the facilitator engages audience members in a conversation about the possibility of alien life in our galaxy. The program ends with an invitation to actively participate in the search for habitable worlds through Zooniverse’s Planet Hunters project. This 30 minute workshop was designed to introduce teens to perhaps the most asked about of space phenomena – black holes. Through a video, hand-on demonstrations, and a small group activity the facilitator guides program participants through. Radio Galaxy Zoo is presented as a way for teens to continue their exploration by helping scientists locate supermassive black holes. We really enjoyed working with these bright and motivated young people! The Zooniverse team has, over the last five years or so, shown signs of growing uncontrollably like some sort of bacterial colony that requires feeding with grant money. The job we’ve just advertised (at Adler Planetarium) might, though, be the most important yet. As those who are eager followers of this blog will know, we’re currently working hard on rebuilding the Zooniverse platform so that it can support many more projects. If the Zooniverse can get to the point where we’re no longer constrained by the number of projects that can be built, we will need to think about how projects get chosen to appear on the Zooniverse, and about who should make that decision. Our opinion is that you – our community – should be more involved, and to work out how to make that happen we’re looking for what we’re calling a ‘community builder’. As you’ll see from the job description, this isn’t a technical post, but rather we’re looking for someone who knows how to build a community that is capable of awesome things. If that sounds like you, please get in touch. PS The post is funded by a new grant from our friends at the Alfred P. Sloan foundation, to whom we’re eternally* grateful.